2009. The UB Bulls are coming off a MAC Championship. The coaching staff of Turner Gill used that advantage in recruiting, and they were excited about the incoming class. Especially a player from Florida. He was a long, lean, undersized linebacker. He wore an unusual linebacker’s number, 46. His name was Khalil Mack. Now I must admit, there have been plenty of times in my role as the Bulls football play-by-play announcer that I’ve attended practice and been told “wait until you see this freshman. He’s gonna be special.” More often, they turned into nice players, but never lived up to the hype. But #46 was different. He looked different. Tall. Athletic. Fast. Quick. He didn’t look like the players that UB usually recruited, and he didn’t look like any of the players they had at the time. Remember, Mack entered college at 220 pounds. He had a great story. Injured playing basketball as a junior in Ft. Pierce, FL he missed that football season. That’s a big blow for football players, because most scholarship offers come after their junior year. Despite returning and starring as a senior, his only football scholarship offer was to FCS Liberty. But then Gill hired a new coach from Liberty, Robert Wimberly. He mentioned to Gill that there was this linebacker from Florida who he recruited that might be an FBS player. A quick look at the tape convinced Gill to make Mack the offer he desired. The kid from Florida was coming to Buffalo. During that redshirt season of 2009 when Mack didn’t play, he dominated practice on the scout team. Imagine, Mack and future NFL running back Branden Oliver were ripping up the UB starters while they were supposed to be helping them prepare for each week’s opponent. After that redshirt season, Mack was ready to make his debut in 2010. But one thing first. He was going to change his number, from 46 to a more-friendly linebacker number. But the NCAA Football video game came out, and gave Mack a 46 rating. Khalil didn’t agree, and for motivation, decided to keep 46 as a daily reminder. The next season, his redshirt freshman year, Khalil started all 12 games and had 14.5 tackles for loss. He was on his way. After his junior year, which featured eight sacks, there was some thought that he might declare early for the NFL Draft. But at the urging of NFL scouts, and his mother (a teacher), he returned for another year and a college degree. How good was he? Was the level a competition a problem? Would he be the first Bull selected in the first round? All those questions were answered with a dominant season opening performance against Ohio State: 9 tackles, 2.5 sacks, 1 interception returned for a TD. As former Bulls quarterback Joe Licata told me in the Daily Drive podcast, when the highlights were shown at the next team meeting, one of Mack’s teammates coughed the word “millions” under his breath as Khalil was diving towards the end zone. Khalil was the 5th overall pick in the 2014 draft, the start of an amazing NFL career that continues with his trip to Buffalo Sunday. The Khalil Mack I got to know was an incredibly hard worker, dedicated to making himself better and proving everyone wrong. He had the help of fellow Floridian Oliver, and together they drove each other to professional careers. 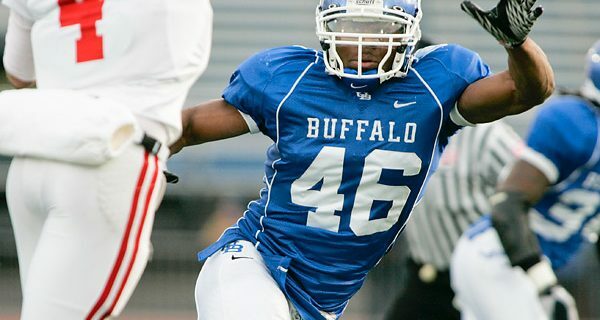 It’s a great story, that might have been written some other way if Mack hadn’t hurt that knee in high school, hadn’t seen that Liberty assistant come to Buffalo, hadn’t used the recruiting slight as inspiration, hadn’t met a friend and inspiration like Oliver, and hadn’t used the spirit of UB and Buffalo to mold him as a man. I’m proud to know Khalil Mack. It still makes me smile to remember how he used to greet me with “Hey, Double-P” every time he walked on the road trip charter flights. While I know Bills fans won’t be rooting for him Sunday, I suggest you add him to your list of favorite non-Bills NFL players. After all, he’s got a lot of Buffalo under that Silver and Black. Khalil Mack’s brother is already here and playing in Buffalo. Read his story here.